Seoul is planning to ban mobile phone ride-sharing app Uber just as the firm aims to accelerate expansion in Asia. The city's council is citing concerns including background checks on drivers, vehicle upkeep, and the impact on the traditional taxi trade. Uber was launched in South Korea's capital last August. 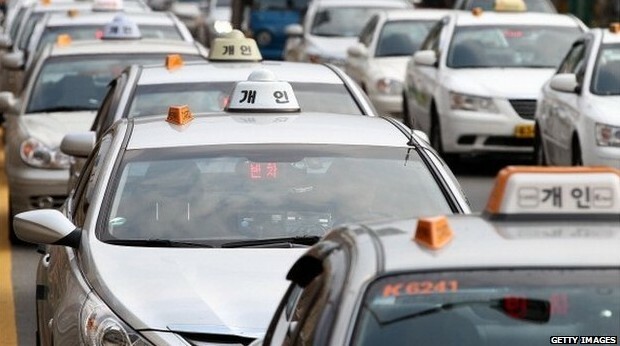 Seoul's city council said it created unfair competition for taxi drivers, but Uber said the comments indicated Seoul remained "trapped in the past". Uber, one of a growing number of smartphone apps to enable ordinary people to share services such as spare rooms, meals and lifts, is shaking up taxi services in many cities. In a statement, Seoul city council said: "We are looking into related laws to block Uber and similar apps that arrange such illegal transportation activities. "Uber is charging customers while avoiding the regulatory process, which creates unfair competition for taxi drivers." In a statement, Uber said: "Comments like these show Seoul is in danger of remaining trapped in the past and getting left behind by the global 'sharing economy' movement." In South Korea the company currently operates only a luxury service, which is significantly more expensive than Seoul's traditional taxis. Uber said it only used registered limousine companies to provide this service and that all drivers complied with safety regulations and were fully insured. Over the past year Uber has been introduced in Singapore, Bangalore and Hong Kong. It began in Beijing last week. But traditional taxi drivers in many cities have criticised authorities for allowing the more lightly regulated trade. Recently, licensed taxi drivers across Europe and in the US staged protests against the company's regular service, which links private individuals with potential passengers. Cab companies say these services are undercutting their business. A Belgian court has ruled the app illegal there. The criticism does not appear to be damaging the company's fortunes. In June it raised $1.2bn in new capital on terms that valued it at $18bn (￡10.5bn). Uber currently operates in 150 cities in 41 countries in the Americas, Europe, the Middle East Africa and the Asia-Pacific.